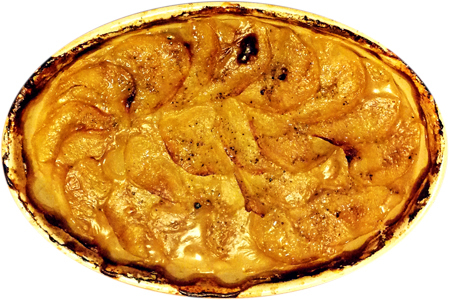 gratin | What's for tea tonight dear? Neither one thing nor the other, but combining something of the best of both. My love affair with pommes dauphinoise began, romantically enough, with late night assignations in a deserted hotel kitchen. Whilst all around us slept I’d sneak into the darkened larder and by only the light leaking from the fridge door would sate my starchy desires with a mouthful of chef Maggie’s magical combination of potato and cream. Since the cardiac kerfuffle of a year ago though I’ve done my best to curb my cholesterol and more often opt for a boulangere, where the potatoes and onions cook slowly in stock rather than cream. But then I thought why choose, when you can combine the two without completely clogging your arteries? Add the wine, garlic and rosemary to the stock and reduce by about a third. Layer the potatoes and onion in a gratin dish, seasoning well with salt and pepper between each layer. Whisk the creme fraiche into the hot stock, and strain this over the potatoes. Cover with a cartouche of baking paper or foil and bake at 160°C for an hour and a half, then uncover and cook for a further half hour. Allow to rest for five minutes before eating. You can of course make a vegetarian version by using vegetable stock, in which case you probably won’t want to eat it with lamb ‘lolipop’ cutlets, with which it eats very well!